Click the image to view the map and play the game. Maps don’t need to inform. They can be fun. Maps can, of course, be fun and inform and in this example they can merely be fun! Cube, a Chrome experiment by Google is designed as a promotional tool for Google Maps. It’s a game, played in the browser, that has you attempting to control the orientation of a cube across which a ball is rolling. The point is to roll the ball to a destination on the three dimensional street map of each face. The game moves against the clock and as you succeed, the cube revolves and you’re challenged again. What Google do well with this game is to make it simple. There’s considerable complexity in the design of the application but the interaction and game-play are intuitive. Because the game is based on the familiar childhood toys that require similar physical movement we automatically have a sense of the familiar and a desire to simply have a go. The map itself is in the typical style of Google Maps which since its launch in 2005 has matured well into a familiar and coherent style in its own right. The third dimension is rendered well with shadow, transparency and simplified buildings. An abstract view of the world and a fun few minutes. 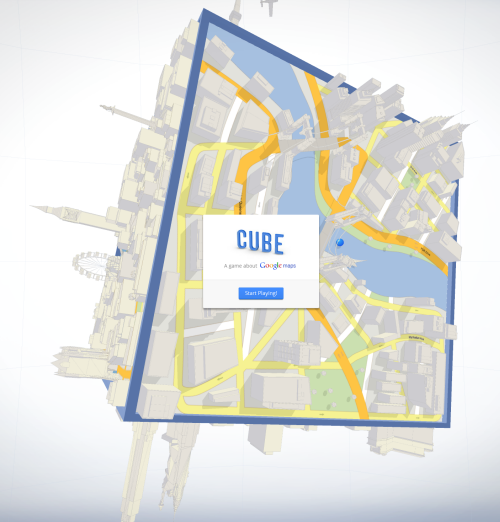 The accompanying promotional video encourages us to ‘Explore your world with Google Maps’ and the use of a physical model of the digital cube is a great counterpoint and promotes the idea of simply playing with the map. This entry was posted in MapCarte and tagged game, Google Maps, MapCarte by @kennethfield. Bookmark the permalink.